From colonial settlements and Civil War sites to the magnificent Blue Ridge Mountains and stunning Great Smoky Mountains, this southern U.S. tour features historic sites, spectacular scenery, and fun experiences all along the way. You'll overnight in the Washington DC area; Gettysburg; Shenandoah National Park; Beckley; Lexington, Kentucky; Gatlinburg; Asheville; Lexington, Virginia; and Williamsburg. History buffs will enjoy visits to the Gettysburg Battlefield, where Abraham Lincoln delivered his immortal speech in 1863; Harper's Ferry, where John Brown made his ill-fated raid on the U.S. Arsenal in 1859; the Lincoln Museum; Sinking Spring Farm, the one-room cabin where Lincoln was born; the Civil War Museum, the fourth-largest Civil War museum in the United States; Biltmore Estate; Monticello Estate, Thomas Jefferson's home; Mount Vernon, home of George and Martha Washington; and Colonial Williamsburg, where life in the 18th century is recreated. Throughout this southern U.S. tour, you'll witness fascinating landscapes. Beautiful views await you in Shenandoah National Park, with its 200,000 acres of protected lands. Marvel at the green pastures, white-board fences, and columned estates in Kentucky bluegrass country. 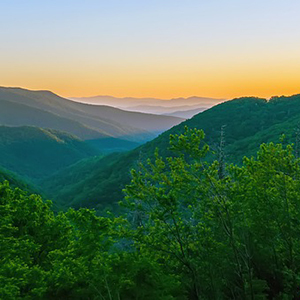 Spend two nights in Gatlinburg, a popular mountain retreat, and drive through the center of the Smoky Mountains, with the winding roads, striking wildflowers, and animal diversity. In Virginia, stop at tranquil Mabry Mill, an old water-driven grist mill that is one of the country's most photographed spots, and visit Natural Bridge, a 215-foot-high limestone arch sculpted by nature in a wooded setting. These are just some of the many highlights of this southern U.S. tour featuring stunning national parks, historic sites, and fun-filled experiences. Grab your camera and get ready for a once-in-a-lifetime vacation!